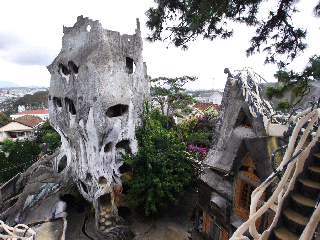 Hang Nga in Dalat is also called the crazy house. It's a large complex of buildings and connecting bridges, one lazily winding over the top roof, very narrow and without much in the way of handrails. The design lacks the angular simplicity of Gaudi's work in Barcelona, it's just... crazy. A large family of hobbits would love it, but all others need to watch their heads. Dalat is otherwise unremarkable. It's a busy town around a lake with a few low hills, but nice enough to walk. At 1500m, it's cool and overcast, unlike hot Hoi An. 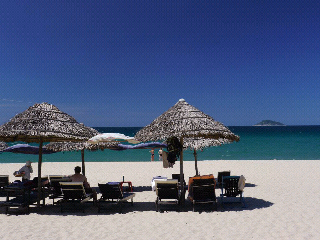 There's a number of beaches around Hoi An and neighboring islands. Fine white sand (somehow managing to be scalding hot in the sun anyway), emerald water with soft surf, palm trees, little beach huts, and very affordable cocktail service. Not unlike Bali except only a handful of people enjoy the beach. Finding a bicycle big enough for me was a bit of a challenge but I found one. Didn't break any speed records on this thing though. Much of the country was devastated in the American War, but a few ancient towns survived. 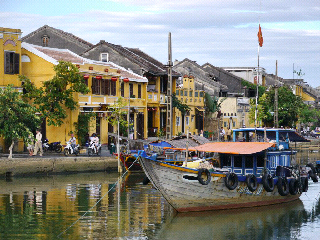 Hoi An is the most popular of those. Almost all buildings in the old center have stood for centuries, and even newer neighborhoods try to be sensitive of the past. I have occasionally complained about towns that sold their soul to tourism, like Aguas Calientes or Sapa, but Hoi An manages to absorb the inevitable glut of restaurants and souvenir shops with grace. And the tourists all seem to confine themselves to the few main streets and don't venture into the many small alleys. It's also somewhat upmarket: there are few budget options and few backpackers, and few pizza places or bars that serve alcohol in buckets. A very pleasant place to stay. The bus between Hué and Hoi An is so boring that all I remember of the last time I used it is being disappointed that it uses the new tunnel rather than climbing over the mountains separating former North and South Vietnam. So I used a motorcycle tour that took me all the way west to the border to Laos, and then to Hoi An. Part of the road was on the old Ho Chi Minh trail. At an overnight stop in Prao I discovered this little village in the fields, built from bamboo and wood. Had fun with some children demanding photos, screaming with delight. After an hour of that they led me into the village, and I made my triumphant entry leading a score of small kids and a couple of watchful older ones, with the smallest riding on my shoulder beaming, and several more holding my hand. So I got invited by the village elder, and was served tea and fruit. On the wall of his house, the biggest of all, hung a picture of Ho Chi Minh and certificates. 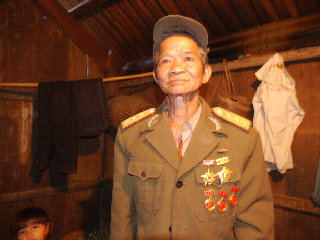 He is also a North Vietnamese war hero from the American War, and put on his uniform with three stars on each shoulder, and many medals. He stood to attention for me to take pictures. 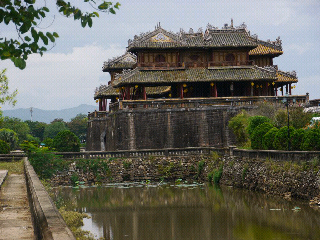 On my last visit, they were still restoring the royal citadel of Hué, destroyed in the American War. Now several more buildings are completed, but there is still lots of empty space with the scars of that war. The walled old quarter is still beautiful, tranquil, and amazingly untouched by tourism. The eastern end of the modern town on the other side of the river, where I was staying in the Orchid hotel, is far more pleasant than I remembered it from my last visit. It's fun to walk the streets at night. 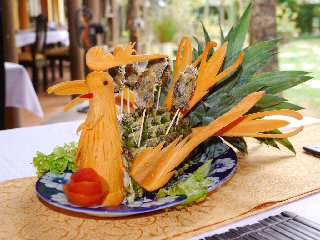 The city of Hue is famous for improbably elaborate meals. Went to a restaurant that I discovered four years ago and instantly loved. It hadn't changed, except now a tour bus was parked outside. Had my usual ten-course lunch, starting with spring rolls. How would you serve spring rolls? Put them on a plate, add a salad leaf, done. Not so here. Begin with half a pineapple, hollowed out, with a candle inside. Form a peacock with carved carrots and tomatoes. Put the spring rolls on sticks so they look like feathers - remember, that's the payload, everything else is decoration. Easy. And so it continues. 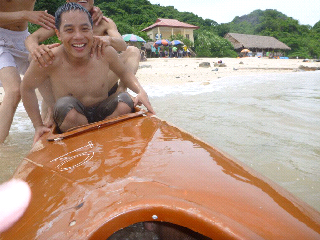 Spent a few days on tiny Monkey Island, just off Cat Ba. The area's highlight is Halong Bay, a dream seascape of steep karst mountains rising from the South China Sea. But I have been there before - and the sky was overcast - so I decided to check out some islands. Everyone here has a cell phone. 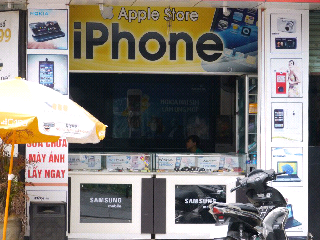 There are phone shops all over the place, and they are all similar: a big and usually brightly colored and slightly fading sign over the door announcing "iPhone" or "Apple Store", a brand-new sign wrapped around the display cases saying "Samsung", and the actual display cases which are filled with Nokia phones. Apple, and now Samsung, may own people's dreams but Nokia still owns their wallets. I did see only one iPhone: an iPhone 4i with 4 GB memory and slightly thicker glass than usual, for 100 €. I bet it has never passed through Apple's hands. Normally electronics tend to cost slightly more than in Europe, even in KL, which surprised me.